Given how perfectly Kristen Stewart is cast as a soldier who serves as a guard at Guantanamo Bay, we’re thinking writer-director Peter Sattler had to have the former Twilight star in mind. Yes, it’s true Stewart truly comes into her own as an actress in a riveting story that challenges what we know and what we think we know. 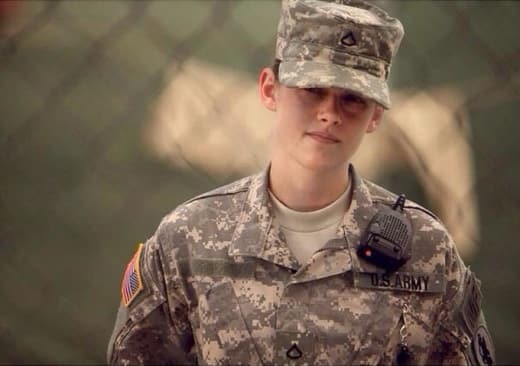 As shown in the Camp X-Ray trailer, Stewart’s Cole joins the military with the hopes that she can do her part to help and change the world. Instead, the idealistic ingénue gets a harsh lesson in the reality of a country confronted with an enemy they’re not sure what to do with. Cole befriends an inmate, despite warnings from her superiors not to talk to, much less engage in conversation with the detainees. Speaking of how this so-called “War on Terror” is confusing, we love how Sattler even makes the point that those inhabiting the prison of Guantanamo Bay are detainees and not prisoners. If they were prisoners, being held for eight years, like the man Cole gets to know, would be a violation of the Geneva Treaty. Through Cole’s interactions with this man, who has been held without trial for eight years, she learns that this world she thought was black and white has shades of grey she never even imagined. And his story is not unique. It could be applied to any one of those held at the Cuban island prison. What we also appreciate about this riveting and powerful drama is how Sattler doesn’t force feed his opinions on the subject down the audience’s throat. Through the story, the characters and how he shoots it, we’re left to draw our own conclusions. And in terms of this writer, those takeaways are not pretty. What happened on 9/11 was an absolute tragedy in the highest order, but watch Camp X-Ray and see if what is painted as the response to that horror is befitting of a country like the United States. And for those who dismissed Stewart as a waif-ish actress who became almost iconic because of her turn that is seen when you watch Twilight online, prepare to have your mind blown. The actress plays the emotional spectrum with such ease and command that the power of Sattler’s tale can be impeccably processed for the viewer. This is not necessarily an Oscar nomination-worthy turn from Stewart, but it sure is close. And the fact that she could someday get one of those elusive nods may not be that far off if she keeps turning in performances like the one in Camp X-Ray.